Avoid these 10 mistakes and discover easy steps to make your home "Fit To Sell." These simple concepts can help you and your RE/MAX Realty Affiliates Sales Associate get the most on the sale of your home. Are you interested in putting your home on the market, but wonder what repairs and touch-ups to do? And then there's bankrolling the work, not to mention sacrificing weekends to get it done. Slow down. Get a grip. There are some no cost/low cost ways to get your home in showing shape and help you put your best foot, or... house, forward to prospective buyers. So what things are important to fix-up and replace before you sell? Let's cover them as the buyer sees them, from the outside in. Walk across the street from your home and pretend you're a buyer, viewing the home for the first time. From the parking area, glance around the front yard. Note hedges and trees that might need to be trimmed. Are they cut back away from the front door, the windows, and the porch area? This is not only for aesthetics but for safety reasons as well (a big priority with buyers today). A safe home is one that has a clear view of the parking area and walk ways, free of obstructions and overgrown foliage. What about paint trim near the front door and on the eaves? Could it use a new coat? Make sure your front door is in good repair, too - including the screen door, if applicable. As buyers enter the home, the first impression sets the stage for the rest of the showing. Dripping water rattles the nerves, and discolored sinks suggests faulty or worn-out plumbing. Burned out bulbs leave prospects in the dark. Don't let little problems detract from what's right with your home. 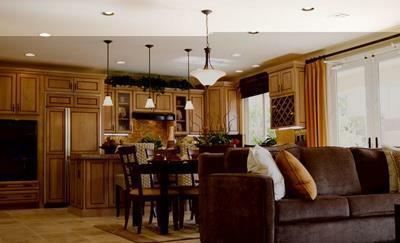 Remember, potential buyers are looking for more than just comfortable living space. They're looking for storage space too. Make sure your attic and basement are clean and free of unnecessary items. Rock-and-roll will never die, but it might kill a real estate transaction. When it's time to show your home, it's time to turn down the stereo or TV. Nobody knows your home as well as you do. But RE/MAX Sales Agents know buyers - what they need and what they want. Your RE/MAX Agent will have an easier time articulating the virtues of your home if you stay in the background. When prospects want to talk price, terms, or other real estate matters, let them speak to an expert - your RE/MAX Sales Agent.